Wire rack shelving offers an ideal clean, visible, small item storage solution. The chrome wire design allows for light and consistent air circulation, making it safe to store technology and other items without building up dust. These wire shelves are easy to assemble and customize. Typically 2-4 shelves high, chrome wire shelves offer the flexibility for incorporating additional units for increased storage, as well as wheels to easily transport materials throughout your facility. How Could I Use Wire Rack Shelving? Chrome wire shelving has proven beneficial for a variety of applications in the home, schools, hospitals, and businesses. Chrome wire shelving provides many benefits that standard storage shelving does not. Each shelf is adjustable in 1-inch increments, allowing the flexibility needed to create the perfect amount of space based on your storage needs. Another great benefit of this type of shelving is that no tools are needed for assembly, so you can construct and install chrome wire decking quickly with ease. The high quality chrome finish is rust resistant, durable, and looks good. Wire rack shelving can also be converted into a mobile cart on wheels with the simple addition of 5-inch swivel locking caster wheels. These carts are constructed to match the highest quality standards. With a shelf capacity of up to 400 lbs, this shelving solution is perfect for a large variety of storage applications. 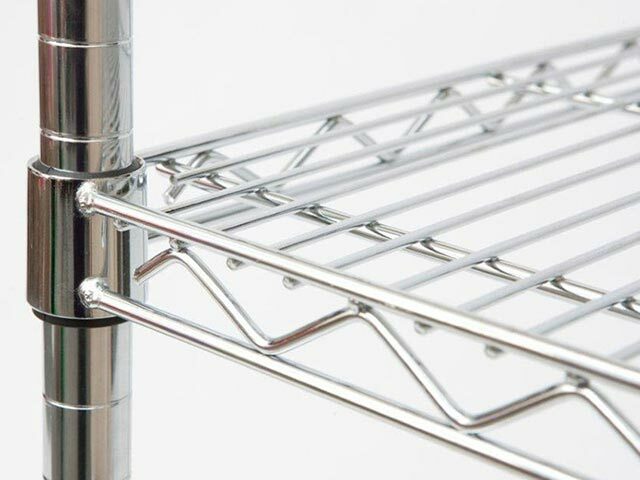 Chrome wire shelving can be customized with other finishes aside from the standard chrome plated finish, including black powder coat or green epoxy, both of which are certified by the National Sanitation foundation. This NSF certification makes them great for the health care industry. A variety of accessories are available to fully customize chrome wire shelving units. These include utility handles, shelf dividers, document holders, label holders, and cantilever shelves. Chrome wire shelving is available as a starter unit. Purchase add-on units to increase your storage density. Each add on unit includes 8 add-on hooks, 8 shelf clips, 4 shelves, 2 posts, and 4 adjustable feet. Why Choose Wire Rack Shelving? Need shelving? Visit the QMH Online Store to shop chrome wire shelving and add on units to add to your existing wire racks. If you want to place a custom order for wire shelving units, give us a call at 1-800-404-RACK and speak with one of our equipment experts today to determine the best solutions for your storage needs.